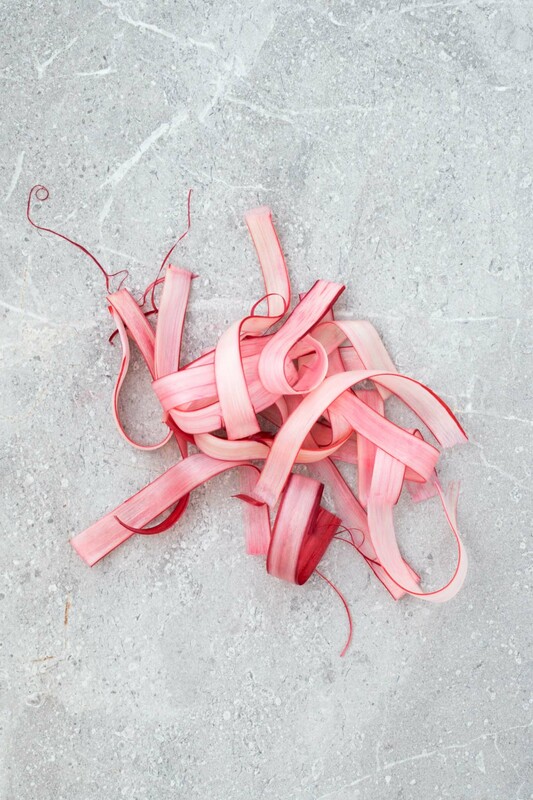 A simple, strikingly beautiful rhubarb garnish for cakes, desserts and cocktails. 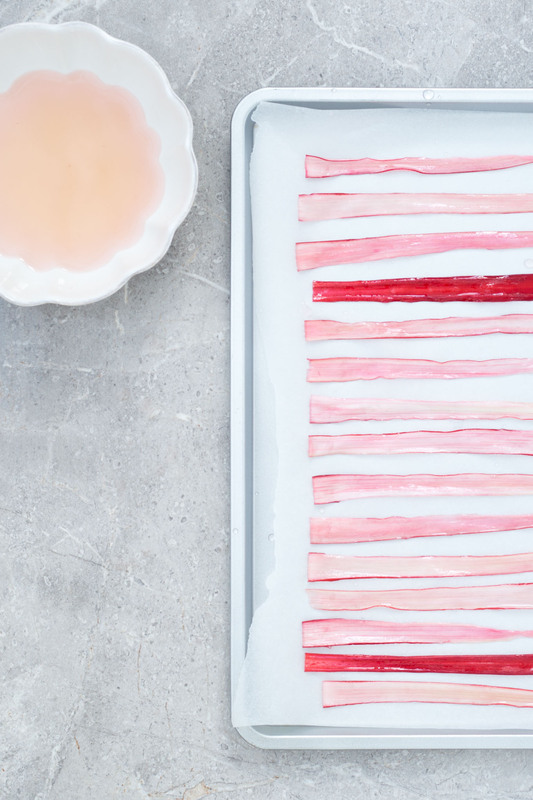 Just soak strips of rhubarb in sugar syrup and dry out in the oven. Rhubarb grows locally where I live in Leeds, grown in huge, dark warehouses and harvested by candlelight to make the pinkest, most delicate rhubarb. 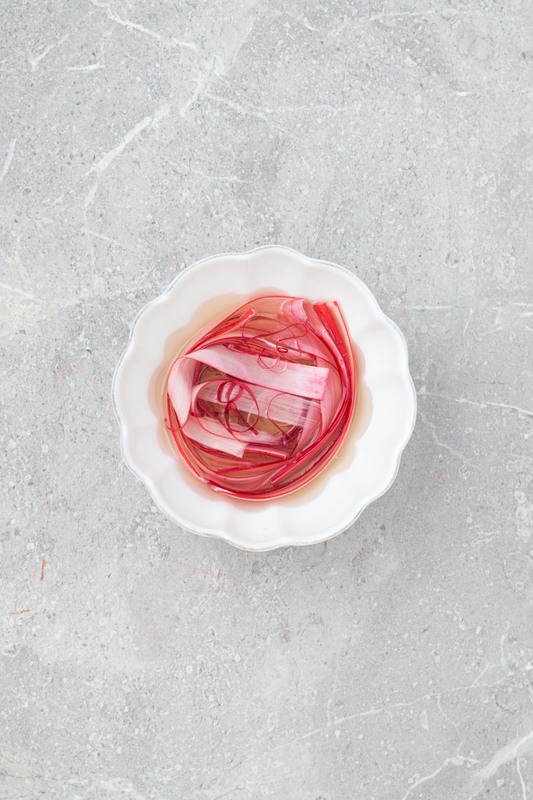 I love its sour tang – my favourite uses are blending it into cocktails (like this Rhubarb fizz cocktail) or pickling it for a tart, crunchy salad (like this Rhubarb salad). 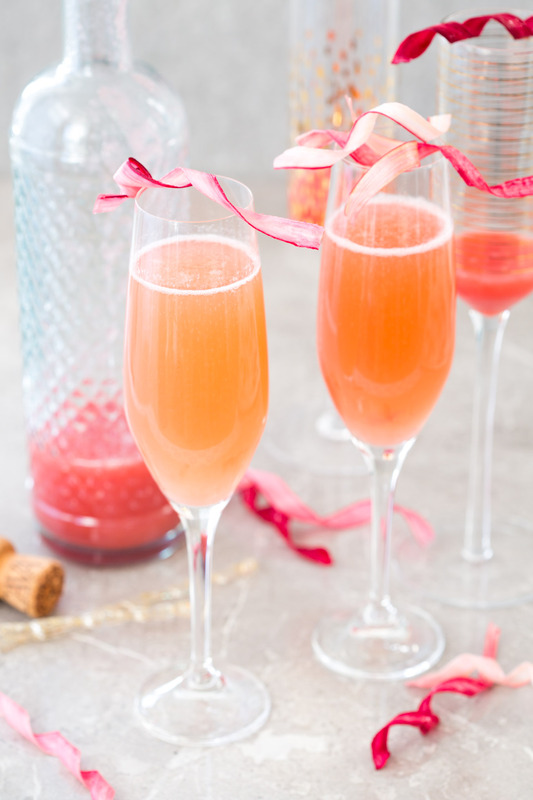 This gorgeous rhubarb garnish recipe was inspired by one I saw on Martha Stewart (I have adjusted the cooking instructions). The curls are very straightforward to make, just make sure you don’t completely dry out the rhubarb. Any leftover syrup is good for using in cocktails, it will be a lovely shade of pale pink after soaking the rhubarb. 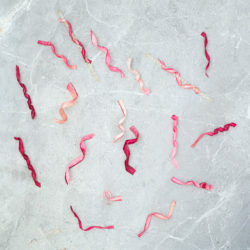 Stunning bright pink swirls that make really beautiful edible decorations. Put the sugar and 250ml water in a small pan. Warm over medium heat until the sugar has completely dissolved. Set aside to cool. Preheat oven to 100℃. 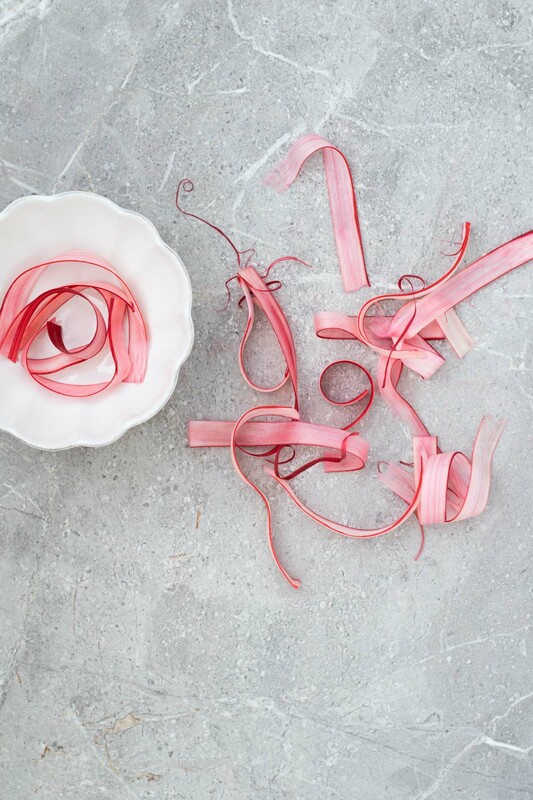 Wash and trim the rhubarb, then peel into long, even strips with a vegetable peeler. Put the cooled sugar syrup in a small bowl and submerge the rhubarb strips. Soak for 5-10 minutes. 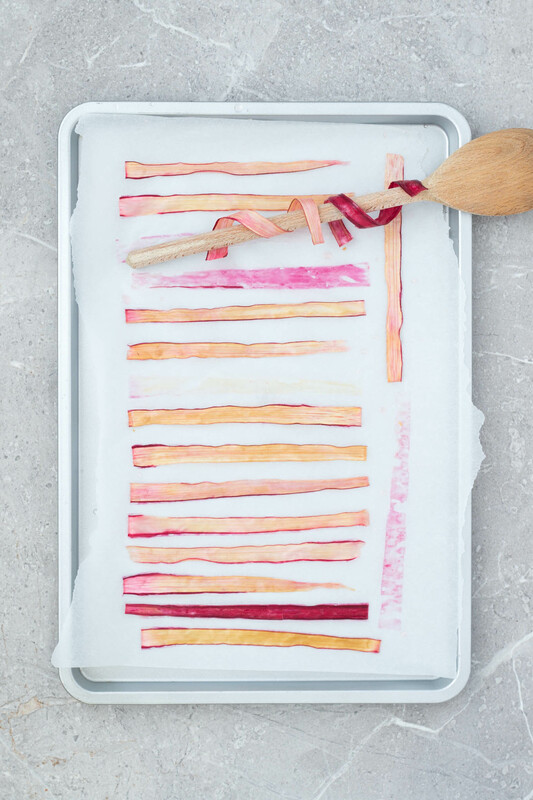 Line a baking tray with paper and arrange the rhubarb strips in a single layer, not touching, smoothing them so they lie flat. Bake until the strips are dried out and fairly crisp – they should be dry and not tacky to the touch. Avoid overcooking, as they will break when you try to curl them. Start checking after 15 minutes. Some slices will be ready before the others, depending on the thickness of the slice and how evenly your oven heats. This is actually handy if you don't have millions of wooden spoons, as you can curl them a few at a time. After you have removed them from the oven work quickly, otherwise they will set. Curl round various implements – wooden spoons, cocktail stirrers (you need quite a lot) and leave to set for 10 minutes. If the rhubarb doesn't hold its shape, it needs a little longer in the oven. If it breaks or cracks, you have cooked it for too long.